Of all species originally described as belonging to the squid family Loliginidae, less than 1/4 are still considered to be valid species within that family. About 8% are valid species in other families. Over half have been synonymized with species that had previously been described. 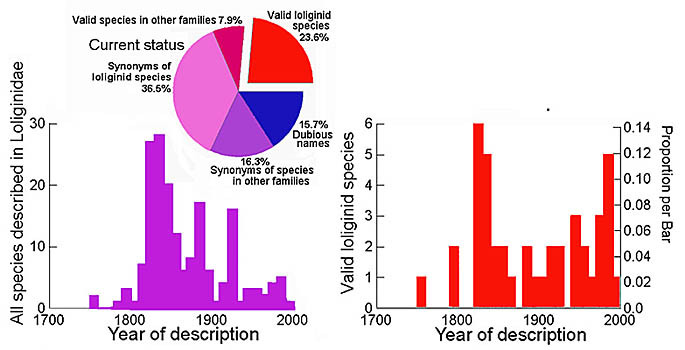 Whereas the rate of description of loliginid species has declined substantially since the middle of the last century, the rate of description of valid species remains fairly high (Sweeney and Vecchione, 1998). As a result, many undescribed species can be expected in that family. Because this is a commercially important family from the relatively well-known waters of temperate continental shelves, new species will probably result mainly from splitting the species currently recognized. Page: Tree of Life Loliginid Nomenclatural History Authored by Michael Vecchione. The TEXT of this page is licensed under the Creative Commons Attribution-NonCommercial License - Version 3.0. Note that images and other media featured on this page are each governed by their own license, and they may or may not be available for reuse. Click on an image or a media link to access the media data window, which provides the relevant licensing information. For the general terms and conditions of ToL material reuse and redistribution, please see the Tree of Life Copyright Policies.